Citation: Karen Junge. 2017. Extreme summer melt: Assessing the habitability and physical structure of rotting first-year Arctic sea ice. Chukchi Sea, Alaska. 2015-2018. Arctic Data Center. doi:10.18739/A28C9R366. Sampling a structurally rotten ice floe offshore. PC: Dr. Karen Junge, July 2017. Highlight: “So-called rotten ice has experienced a long summer of melt, is fragile, difficult to work with, and has received little attention. Comprehensive information on its physical and microbiological properties does not exist,” – Dr. Karen Junge. 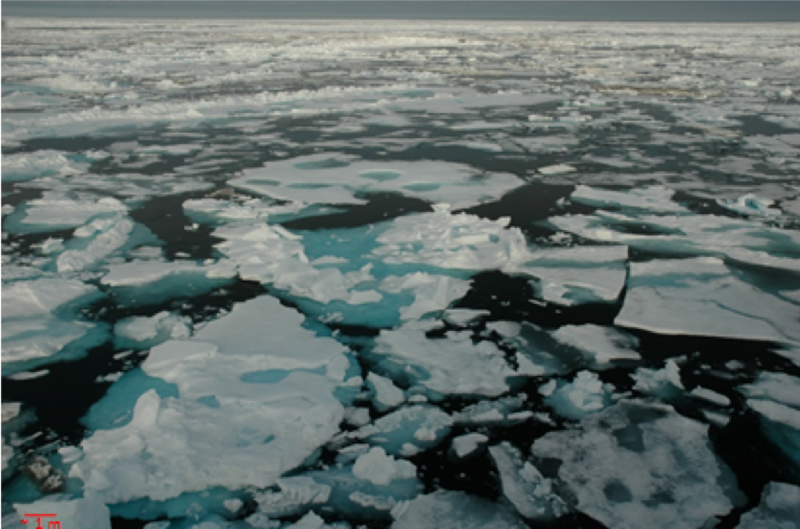 Decreases in ice extent, concentration, and thickness have all been observed in the Arctic as sea ice responds to a changing climate regime with earlier melt and later autumn freeze-up. Dr. Karen Junge, Senior Oceanographer at the University of Washington’s Applied Physics Laboratory, and her team (co-principle investigators Dr. Bonnie Light and Dr. Monica Orellana and postdoc Carie Frantz, among others) are studying a less-familiar type of Arctic sea ice that could become more prevalent as the climate continues to warm: rotten ice. This dataset is part of a project that is examining the microstructural properties and potential habitability of rotten ice. The team traveled to Utqiaġvik (formerly Barrow), Alaska, to study rotten ice from shorefast and drifting ice off the Utqiaġvik coast. Dr. Bonnie Light led the team in collecting data on the physical properties (temperature, salinity, density, microstructure) and optical (light scattering) properties; while Dr. Junge and Dr. Orellana led the team in collecting data on the biological properties. 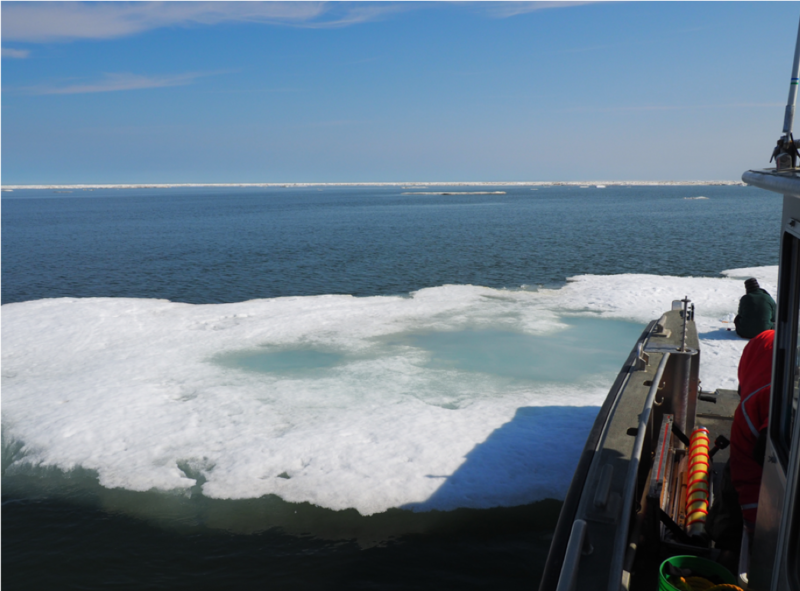 Being pioneers in rotten ice sampling, the team relied on local Inuit knowledge regarding on-site sea ice and weather conditions to ensure safe access to drifting rotten ice floes and safe ice sampling conditions during their fieldwork. First-year Arctic sea ice at the height of summer melt in the Chukchi Sea (scale ~1 m). PC: Dr. Karen Junge. Junge notes that no formal criteria exist to qualify when ice becomes rotten, so they sampled melting ice at the point where its structural and optical properties advance beyond the summer melt season peak. As Junge and her team continue to study and learn more about rotten ice and its biology, the project’s data could assist modellers working on understanding and predicting Arctic climate and large scale ice formation, melt and movement. Junge hopes other ice scientists will benefit from having access to their data through the Arctic Data Center database, and that researchers start to take more advantage of the wealth of data available as they address the changing Arctic. To learn more about the project, check out the dataset; and, to see Junge and her team sampling rotten ice in the field, watch these videos published by the Applied Physics Laboratory at the University of Washington in July 2015 and November 2015. (L-R) Sampling on the ice; the ease of access using a ramp-equipped small boat; and preliminary ice core processing onboard. PC: Dr. Karen Junge, July 2017.